During his MBA coursework with Professor of Practice Corey Billington (left), Brad Orr (right) and his classmates worked with the metalworking company Craftco out of Sheridan. Orr was subsequently hired on as marketing manager. The Institute of Innovation and Entrepreneurship ushers in a new era for students and innovators across the state. Wyoming’s wide-open frontiers are home to outside thinkers hungry for a challenge. They share a spirit of adventure, restless curiosity and wonder. The world needs more cowboys, and the University of Wyoming’s Institute of Innovation and Entrepreneurship (IIE) calls on innovators from throughout the state as it works to instill entrepreneurial thinking to empower the leaders of tomorrow. Adding needed programs and curriculum that draw together all UW colleges, business services and entrepreneurship competitions, the IIE serves as the university’s front door for the state’s entrepreneurs. After the IIE’s initial approval in the spring of 2018, Chief Operating Officer Jack Mason was hired along with College of Business Rile Chair of Entrepreneurship and Leadership Patrick Kreiser, Assistant Professor Matthew Fox, and College of Engineering and Applied Science Professor of Practice Peter Scott. The team is now developing a detailed plan for the IIE and its related curriculum. Long-term goals include creating a campus-wide culture in which the values of innovation and entrepreneurship are instilled in UW students, creating knowledge and technologies to drive new economic opportunities, connecting with communities around the state to provide the support needed to bring their innovative ideas to fruition, and keeping Wyoming’s best and brightest in the state to pursue higher education. 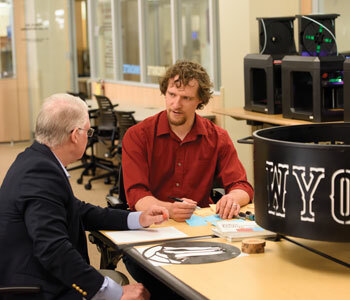 In addition to building on the strengths of existing programs such as the Wyoming Technology Business Center incubators, the Small Business Development Center Network and entrepreneurship competitions, the IIE will strategically add new centers to address unmet needs and complete the portfolio of offerings that support students and entrepreneurs at every stage of the innovation process. “The IIE has already identified and funded three new ventures that should provide immediate impact and early ‘wins,’ as well as support and examples for entrepreneurs,” Mason says. These three ventures include the Center for Business and Economic Analysis and the Health and Biosciences Innovation Hub, which you can read more about below, as well as the Center for Design Thinking. Additional potential candidates for new ventures are also being explored. Assistant Professor Matthew Fox meets with chemical engineering Associate Professor Katie Dongmei Li-Oakey about her business, TLS Materials LLC. 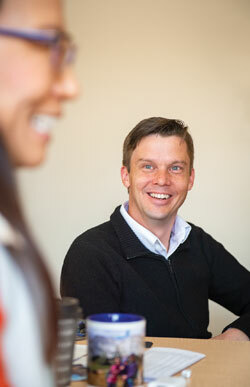 Fox is part of a recent cluster hire in entrepreneurship. The new Center for Business and Economic Analysis will support the economic growth and diversification of Wyoming’s economy through applied economic and business analytics for communities, industries and entrepreneurs. Throughout the United States, such centers are housed at universities and have been serving their communities for decades as key regional partners providing economic insight and data analysis. The need for such a center in Wyoming became apparent with Gov. Matt Mead’s ENDOW initiative and establishment of the IIE. The center’s mission is to provide professional economic insight about Wyoming by tracking and interpreting regional conditions and supplying local and state economic forecasts; undertaking economic impact assessments; conducting specialized analyses, studies and projects, including guidance for investors, policymakers and entrepreneurs; and studying and disseminating population demographic and workforce conditions to support regional development. The center aims to be the trusted destination resource for information about Wyoming’s economy, to empower robust economic growth and diversification, to serve as a bridge of engagement between UW and the broader state community, and to be recognized nationally as a premier organization among its peers. As part of this mission, the center plans to be flexible and responsive to the needs of state and the university. It will also provide UW students with service and experiential learning opportunities that have meaningful impacts, increase student placement prospects and create opportunities for students to live and work in Wyoming upon graduation. The center will serve as a conduit for channeling faculty expertise from all corners of the university into applied economic and business projects for the benefit of Wyoming. It will also develop deep working relationships and channels of communication with communities throughout the state and disseminate Wyoming economic insight and data. Current projects underway include the economic impact of INBRE funding to the state of Wyoming, the economic impact of Laramie Jubilee Days on Albany County, and jointly with the Department of Agricultural and Applied Economics the economic impact of the Casper Events Center. All three projects are spearheaded by visiting Assistant Professor Benjamin Cook and College of Business Associate Professor David Aadland. UW professors and students have been doing related state economics work for many years, and the Center for Business and Economic Analysis brings the work together under one roof to harness its potential and create a visible resource for the people of Wyoming. 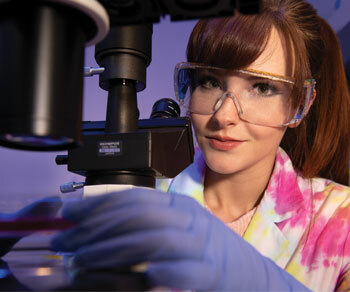 Doctoral student Anne Chenchar works in School of Pharmacy Professor Sreejayan Nair’s biomedical research lab. As part of the new Health and Bioscience Innovation Hub, they are working with a Wyoming physician who has an idea for treating and preventing an acute condition and needed UW’s help with the basic research for his proof of concept. Entrepreneurs and researchers with ideas for next-generation health and wellness solutions can get assistance from the new Health and Bioscience Innovation Hub. “We believe that Wyoming has the potential to be a global center for health and wellness innovations,” says School of Pharmacy Dean Kem Krueger. These innovations can include human and animal pharmaceuticals, nutraceuticals, dietary supplements, medical devices, wellness and sports medicine solutions, and personalized and preventive medicine. The hub will serve as the interface for the human, physical and financial resources necessary to develop intellectual property from initial idea to foundational research through the launch of viable businesses that can enhance Wyoming’s economic diversity. The biotech startup market is characterized by the need for expensive equipment, high failure rates and a regulatory approval process that results in a lengthy time from proof of concept to market. Establishing the hub as a nonprofit entity in Wyoming can serve as a catalyst to help entrepreneurs navigate these pitfalls, bringing together funding, advisers, investors and talent to generate a self-sustaining and growing entrepreneurial ecosystem. In addition to its other services, the hub will potentially include laboratory spaces and equipment in several locations throughout the state. As more and more people flee expensive big cities, Wyoming offers a distinct and balanced lifestyle to entrepreneurs and bioscience professionals. The state already has much of what is needed to constitute an entrepreneurial ecosystem for innovations, and the hub will help fill existing gaps, providing capital, expert advising, facilities, equipment and a high-skilled workforce. The hub will also serve as an oversight mechanism for investors and other stakeholders, vetting projects and ensuring approved projects progress to market by setting and reviewing specific benchmarks. The Health and Bioscience Innovation Hub will be established as part of an independent nonprofit organization and will consist of two parts that work synergistically to meet client needs at both ends of the product development cycle. One of the parts, SPARK-Wyoming, will be based at UW and will serve clients with projects in the early pre-clinical phase of product development. The second part of the hub is an incubator and accelerator focused on human and animal health startup biotech companies. The SPARK program started at Stanford in 2006, and SPARK Global now has affiliated programs at more than a dozen institutions worldwide. “The mission of SPARK is to educate science researchers at universities to propel their ideas from bench to bedside,” Krueger says. This includes helping academics overcome obstacles, educating faculty and graduate students on the path to clinical application, and developing more cost-effective approaches. As part of the SPARK model, a volunteer board of expert advisers helps screen projects and shepherd them through the process. Joining the network gives UW added resources and opportunities for collaboration. Krueger says: “We believe we can build the support for business and scientific infrastructure. The idea is to create this biotech ecosystem whereby early-concept research comes to the university. That can help support graduate students, who in turn build relationships with and learn to interact with private companies, in addition to traditional public funding opportunities. We’re diversifying not only our research funding stream but our opportunities for our graduate students as well. The hub already has its first external client: a physician from Wyoming with an idea for treating and preventing an acute condition who was in need basic research for his proof of concept. He was paired with an expert researcher at UW whose lab can help. In the future, the latest medicine to treat your condition or the newest medical device may come from right here in Wyoming. The IIE team is developing an approach to support entrepreneurs inside and outside the university that will integrate existing programs and form a Business Creation Factory. In addition to student entrepreneurs receiving support from IIE programs, students will also gain hands-on learning from work done in classes and via internships in the Business Creation Factory. Such experiential learning is already taking place in many undergraduate and graduate classes. “We get better learning outcomes with experiential learning,” says Corey Billington, a professor of practice in entrepreneurship in the College of Business. Billington’s undergraduate and MBA students have helped businesses across the state for several years. Tanya Engel graduated with her executive MBA this past spring. During her entrepreneurship class with Billington, Engel was part of a team assigned to work with the Cody-based company Hopehearth, a family pottery business that uses molds and wanted to employ people who needed to work from home, such as veterans with PTSD and stay-at-home parents. Engel found the process helpful to her current job as a graphic designer in Laramie’s UW Extension office, where the team was conducting a review of publications. She applied the business analysis concepts she learned in the class. Engel also found the class brought together many of the program’s previous classes and her professional experiences. Cody Mayor Matt Hall, who works hard to cultivate entrepreneurship in his town, plans to send more businesses to UW for assistance. A task force is working to create a broad spectrum of entrepreneurship curricula for all UW students. Other components of the IIE include the Center for Design Thinking and student innovation centers. In addition, proposed elements include a Center for Disruptive Technologies that would combine technical and business innovation expertise from the university with high-tech industry commercialization partners to solve problems and create disruptive technologies that drive economic growth and diversification. Another proposed element is the Incentive Fund for Entrepreneurship. The fund would help UW and the UW Foundation work with private-sector partners and investors to fill the need for seed and early-stage equity capital. Mason and the IIE team are meeting with stakeholders, contributors and participants inside the university and across the state to develop the IIE’s strategic plan. Drawing upon this strength, the IIE puts to use UW’s experts in high-quality research and technology development to form a vibrant community that makes the university a most valued asset in building a better tomorrow for Wyoming.